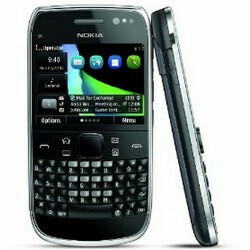 The Nokia E6 is one of the first handsets featuring Symbian Anna, but getting it subsidized on a carrier in the States is simply impossible for the time being. So die-hard fans of the portrait QWERTY Nokia E series have no other choice but to resort to retailers like Amazon, which started offering the unlocked version of the quad-band Nokia E6 for $450. Along with the higher price tag, comes freedom from any contract ties, so you can make your own choice of a service provider. It will start shipping withing one to two months and you'll be able to use its 3G capabilities on both AT&T's and T-Mobile's data network as the Nokia E6 comes with pentaband 850/900/1700/1900/2100 UMTS/HSDPA plus GPRS/EDGE support. But it is a GSM phone only, so you can't use it with Sprint or Verizon. In terms of the pure technical details, you'd be impressed with the pixel density of 326ppi on the smallish 2.46-inch screen. On the back, there is a pretty capable 8-megapixel fixed-focus camera capable of recording 720p HD videos. Just as most other high-end Nokia handsets, the E6 comes with free maps and voice guided navigation. Feel free to check out the stunning camera samples provided by Nokia and stay tuned as an in-depth review of the Nokia E6 is also coming up soon!